LOS ANGELES, Feb. 22, 2017 /PRNewswire/ -- Building on their existing long-standing relationship, IMAX Corporation (NYSE:IMAX) and The Walt Disney Studios, a division of The Walt Disney Company (NYSE: DIS), announced today that both companies have extended their multi-faceted agreement with a new multi-picture deal — beginning this year and extending through 2019 — that includes the much-anticipated live-action and animated tentpole releases from Disney, Walt Disney Animation Studios, Pixar, Marvel and Lucasfilm. Highlights of the agreement include IMAX's involvement in the release of Lucasfilm's untitled Indiana Jones film, untitled Han SoloStar Wars anthology film, Star Wars: The Last Jedi and Star Wars: Episode IX; Marvel's Black Panther, Ant-Man and the Wasp, Captain Marvel, Avengers: Infinity War and the untitled Avengers sequel; Disney'sBeauty and the Beast, A Wrinkle in Time and Mulan; Pixar's The Incredibles 2 and Toy Story 4 and Walt Disney Animation Studios' Wreck-It Ralph sequel. 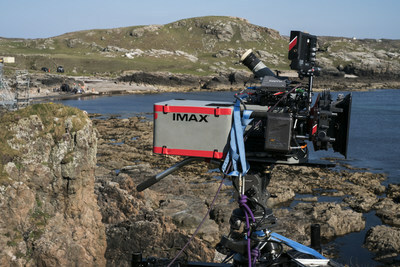 Following J.J. Abrams' iconic use of IMAX® cameras in Star Wars: The Force Awakens, the companies have also announced that director Rian Johnson has captured key sequences of Star Wars: The Last Jedi using IMAX's extremely high-resolution cameras, delivering IMAX audiences greater scope and increased image quality in IMAX's exclusive aspect ratio for a uniquely immersive experience. Additionally, as previously announced, Avengers: Infinity War and the untitled Avengers sequel will be shot in their entirety by The Russo Brothers with IMAX® cameras. "The Walt Disney Studios strives to bring great stories from visionary filmmakers to life for audiences around the world, leveraging the best technology available to create exceptional theatrical experiences," said Alan Bergman, President, The Walt Disney Studios. "That's what IMAX brings to the table, and we look forward to continuing to work with the IMAX team on the unparalleled upcoming slate of films from Disney, Pixar, Marvel, and Lucasfilm." As part of the new agreement, both companies will work together to create exclusive IMAX marketing materials, particularly for those films captured using IMAX cameras or featuring an expanded aspect ratio exclusively in IMAX® theatres. In 2016, Disney occupied four of the top ten IMAX spots at the global box office, including Rogue One: A Star Wars Story, Captain America: Civil War, Doctor Strange and The Jungle Book. "Disney is at the top of its game, offering fans around the world highly original and diverse movie-going entertainment, which aligns perfectly with The IMAX Experience® as the most captivating and unique theatrical presentation," said Greg Foster, CEO of IMAX Entertainment and Senior Executive Vice President, IMAX Corp. "We look forward to continuing our collaboration with our close friends at Disney and this elite group of filmmakers to bring first-class entertainment to the IMAX theatre network. We are particularly excited to announce Rian Johnson's use of IMAX cameras on Star Wars: The Last Jedi as we embark on a year that will feature more films with IMAX differentiation than ever before in our history."